The analytical research report titled “Sports Nutrition Ingredients Market: Global Industry Analysis (2012-2016) and Forecast (2017-2025)” published by Persistence Market Research covers every aspect of the market that the reader can use to gain stability in the global market. It portrays key acumen that the reader can use to gain tempo in the market with respect to growth and devise key strategies followed up with execution. The research report enables the reader to shape up according to changing market dynamics with a view to gain competitive advantage in the coming years. Global sports nutrition ingredients market research study focuses on several opportunities, trends, drivers and restraints across key regional markets in the globe. This delivers a global perspective by covering all the key areas presenting a holistic view of the market. This assists the reader to get a detailed understanding about the regions with optimum potential in order to slate investment decisions and expansion strategies. The research study eliminates all the biasness giving a more realistic shape to the market acumen. Credibility of the researched data and statistics lie in the uniqueness of the research methodology which ensures higher accuracy. In-depth assessment of the global sports nutrition ingredients market is underpinned by an extensive research process that includes both secondary and primary research to obtain relevant statistics and numbers. The data collected undergoes validation and re-examination multiple times, during each step of the primary research, till the research concludes. This ensures delivering value with data having higher degree of accuracy. The expert opinions of the market observers and the subject matter experts is extrapolated and triangulation of these enables the analysts to arrive at a much accurate global market representation. The research report on global sports nutrition ingredients market includes a dedicated chapter on competitive scenario which covers key players and their standing in the global market. The section involves strategies applied by major players, along with their product synopsis, new innovations and key developments, product lien expansions, their area wise spread and future expansion tactics, mergers and acquisitions taken place, the market shares and revenues of these tier players, financials, key personnel, etc. This intelligence dashboard completes with the inclusion of the analysis of the various aspects of the key competition in the market. Competitive assessment has been done in a systematic way to enable the reader to draw necessary conclusions. The comprehensive research report on global sports nutrition ingredients market provides valuable insights with weighted analysis. Every organization has its own integral research team, which strives to gather sufficient research data of the market. Persistence Market Research aims at doing all the heavy lifting by providing unbiased insights which can be actioned by the research team thus supporting in achieving their research milestones. There are several reasons reinforcing the value of this research report, such as un-biasness in data collection, detailed and comprehensive and a weighted segmentation of the entire market, the key trends and developments taking place in the market, statistical analysis reaching maximum accuracy, global market forecasts which gives an idea about the future market scenario based on the current and the past market dynamics and assisting the reader in slating important strategies in order to maintain the right rhythm and overcome the challenges caused by the changing market dynamics to achieve competitive advantage. There has been growing interest of consumers in the sports nutrition category during the recent past. In the current scenario, sports nutrition is not only the domain of athletes, but also includes health-concerned fitness and lifestyle consumers. Consumers are embracing health practices, including gym, yoga, and consumption of food with health benefits. This has led to an increase in the demand for sports nutrition products. Protein supplements, including whey protein, have gained immense acceptance among athletes and the gym going population as an effective and most efficient source of energy, along with vegetables, fruits, and meat products. This has accelerated due to the increasing appeal for protein as the most important ingredient in the overall sports nutrition products market. Proteins help increase energy, optimize weight management, and increase muscle mass and strength. 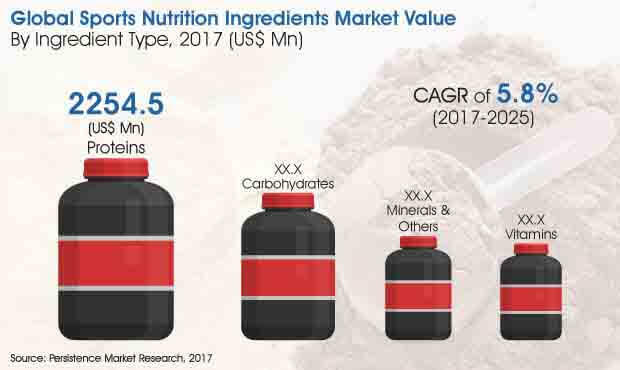 According to the research report on global sports nutrition ingredients market, it is anticipated that the market will witness steady growth during the assessment period. The global market for sports nutrition ingredients has followed a steady positive growth graph before 2017 and is poised to draw a positive upward graph in the coming years. The global sports nutrition ingredients market is expected to grow at a value CAGR of 5.8% during the period of assessment, 2017-2025. The global market showcased a value of around US$ 4.5 Bn in 2017 and is estimated to reach a value of more than US$ 7 Bn by the end of the period of assessment. This growth can be attributed to the increasing focus on sports nutrition encouraging new product development and increasing awareness of sports nutrition. Proteins segment in the ingredient type category is the largest segment with a high market value. In 2016, this segment dominated the global market with a high market share and is expected to lead the market by the end of 2025 as well. In 2017, the proteins segment is valued at US$ 2.2 Bn and is estimated to touch a valuation of more than US$ 3.5 Bn by the end of the assessment year. It is projected to grow at a value CAGR of 5.9% during the period of forecast, 2017-2025. Carbohydrates segment in the ingredient type category is expected to grow at a significant rate in the coming years. Carbohydrates consumption increased dramatically over the past couple of years. This segment is estimated to be the second largest, after proteins segment, and is projected to grow at a 5.8% value CAGR during the 2017-2025 timeline. From an estimation of around US$ 1.6 Bn in 2017 it is anticipated to reach US$ 2.5 Bn by the end of the assessment year (2025). Minerals are essential for providing hydration, nerve transmission and muscle contraction among athletes. The minerals and others ingredient type segment is expected to reflect a value of about US$ 500 Mn by the end of the assessment year from around US$ 340 in 2017 and is projected to grow at a moderate value CAGR during the said period.